A personal appeal to our prime minister from the young people of Hiroshima goes straight to the generals and bureaucrats at the Ministry of Defence. 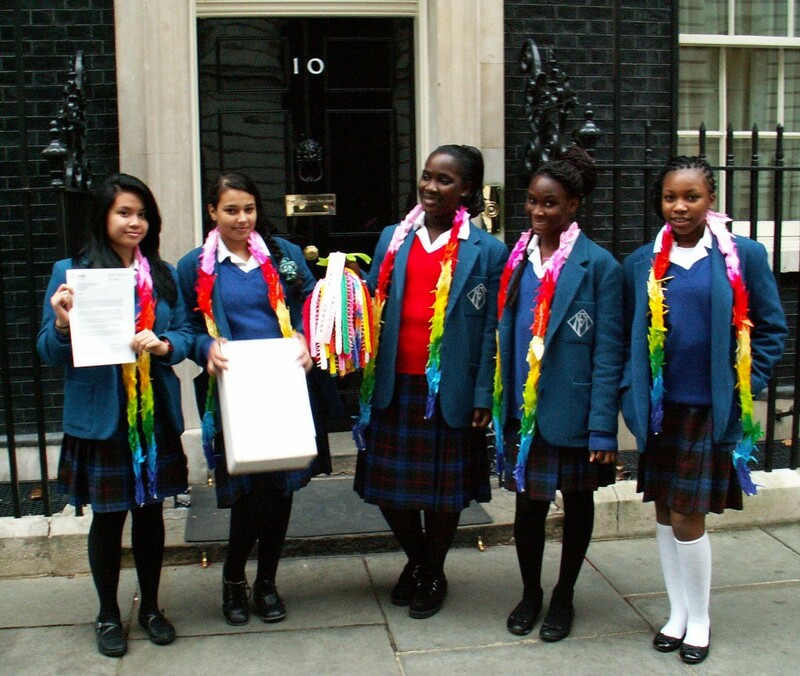 On December 3rd 2012, London schoolchildren delivered a special present to Downing Street, as part of a project to send 1,000 hand-folded paper cranes to the president or prime minister of every UN member state, from the young people of Hiroshima. They also delivered a letter addressed to David Cameron, asking specifically for a message of support for a global treaty to outlaw and eliminate nuclear weapons. His response to this will be displayed, together with messages from other prime ministers and presidents, in Hiroshima and online. Headed by a statement from Ban Ki Moon, the messages from national leaders are already beginning to appear on the ICAN (International Campaign to Abolish Nuclear Weapons) website. Among the first and most heartfelt statements are those from Kazakhstan and from the Marshall Islands. These are the countries, after Japan, which have suffered most by actual detonation of nuclear weapons, in tests on their territories. On being pressed for a report of progress we are informed by the Prime Minister’s office that the gift of 1000 hand-folded paper cranes has been forwarded to the Ministry of Defence. This is to be his response to a hand-crafted personal gift? One wonders what they will do with it. (Even their ‘peacemaking’ is normally done with military hardware.) It appears that the letter from Hiroshima has also been sent to the Ministry of Defence “for reply”. A personal appeal to our prime minister goes straight to the generals and bureaucrats. Is this how we do things here? We claim competence to wield weapons of mass destruction yet have no competence to deal with a simple peacemaking gesture. Nobody wants the response from the Prime Minister of the United Kingdom to appear to be ludicrously inadequate but that is what will happen unless someone takes the matter properly in hand. 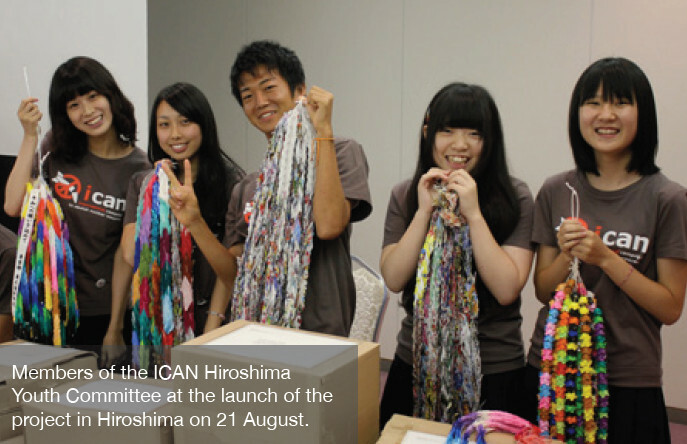 Young people of Hiroshima are reaching out in practical love of humanity and real friendship, to the prime ministers or presidents of all the UN member states. They reach out with a gift and a letter, appealing to common sense, justice and humanity. The gift in every case is a thing to be treasured for its natural beauty and for the significance of the work that has gone into it. One thousand hand-folded origami paper cranes, “each one a prayer for a peaceful nuclear-weapon-free world”, are tightly threaded together and assembled into a unique and colourful object. 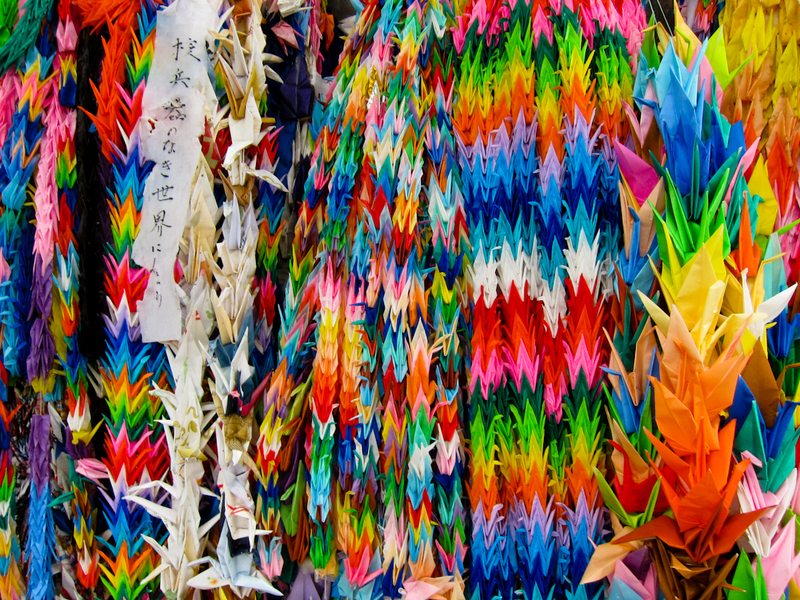 Unique if not for their being sent to 180 countries – over 180,000 paper cranes in total. Why cranes? Why a thousand? Fifty seven years ago a twelve year old girl lay dying in a Japanese hospital. 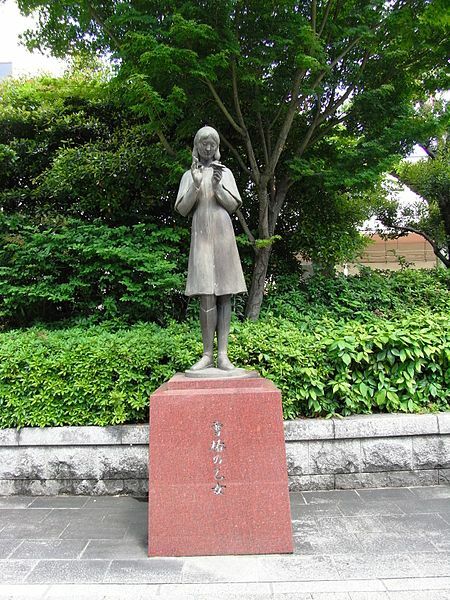 Sadako Sasaki was a survivor of Hiroshima. For a two year old baby, who was only one kilometre from the centre of the blast, to be growing into a healthy young girl must have seemed like a miracle of hope, but it was not to be. After 10 years she was showing signs of radiation sickness and was diagnosed with leukaemia. She did not survive, but a different kind of miracle emerged. Sadako had learned that, according to Japanese legend, if she folded 1,000 paper cranes she would be granted a wish, in her case a wish for life itself. She started out folding dozens of cranes each day. When she ran out of paper, she used medicine wrappings and whatever else she could find. But as her condition worsened she could only manage to fold one or two a day. Sadly, she died before reaching her target, but then the other miracle began to happen. 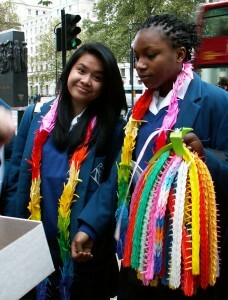 Sadako’s friends completed the one thousand cranes. They ensured that her name is remembered. Sadako now symbolizes the impact of nuclear weapons on children. The origami cranes have become a symbol of hope and peaceful resistance to preparations for nuclear destruction. In Hiroshima and some other cities there are statues of Sadako which are regularly draped with colourful strings of cranes and it is the voice of young people that is most effectively coaxing the world away from nuclear madness. nuclear weapons than these others, because nuclear weapons depend on a vast amount of engineering and are easier to detect, but politically it is more difficult. The Convention on Nuclear Weapons was first put before the UN by Costa Rica in 1997 and then again in 2007 by Costa Rica and Malaysia. It is actually a model for a UN treaty; it is a basis for the start of negotiation. 146 countries, i.e. nearly all those outside of NATO and other nuclear alliances, support the immediate commencement of negotiations on the NWC. Five of the nuclear nations: USA, Russia, Israel, France and UK, do not support commencement of negotiations on the NWC. The UK position is that NWC would at present be “premature and potentially counter-productive”, citing the risk of diverting political capital and resources away from the Non-Proliferation Treaty (NPT). But the NPT is itself at some risk because of failure of the nuclear states to meet obligations under Article VI and indeed the development of new weapon systems like our Trident replacement programme, already underway. commonplace but it is simply not acceptable to deceive young people. time we could bid for hosting the Agency which will administer the NWC treaty.